Zero Rust exceeded 2000 hours at 3.5 mils d.f.t. (dry film thickness) in the ASTM-Bl17 salt spray tests. This was previously unheard of in an air-dry coating. The effectiveness of Zero Rust on bare steel surfaces is optimized at 3.0 to 3.5 mils dry film thickness over profile. 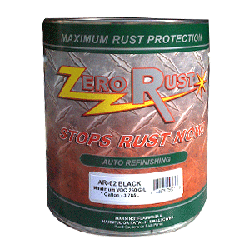 Zero Rust should provide five years of protection for every 3 mils of d.f.t..